I last visited Italia back in November whilst it was still in it’s ‘soft launch’ period after being rebranded under new management. I had a fantastic time that night with the only disappointment being a lack of interesting desserts, this was understandable as the restaurant had only been open a couple of weeks and the menu was still under development. Since then they have added several including cheesecake, pannacotta and most excitingly for me Rum baba! I’d been desperate to get back and taste it for weeks and last Tuesday was Mrs Food Geek’s birthday, the perfect opportunity for eating lots of desserts! We arrived at around 6pm and it was very quiet, in fact there was only 1 other table eating which was surprising and very different to the last time we visited. I’m not sure why but I always worry when i’m in empty restaurants. We were also a little disappointed to find that Piero, the slightly mad but very lovely front of house manager was not working, he was definitely a highlight of our previous visit. The menu has certainly increased in size since last time and there were a number of exciting specials on the board. We started with a portion of Sicilian Nocellara olives and a garlic pizza bread with mozzarella and fresh chilli. 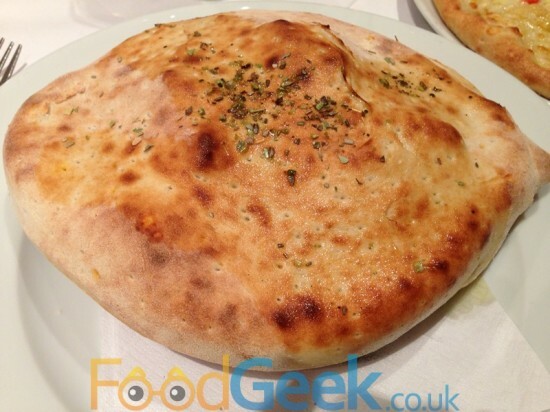 The olives were really fresh and excellent quality whilst the garlic bread was light, thin and crispy with loads of stringy mozzarella cheese, delicious! My main starter was something i’d been looking forward to since first hearing about the dish, ‘Lobster Ravioli’. 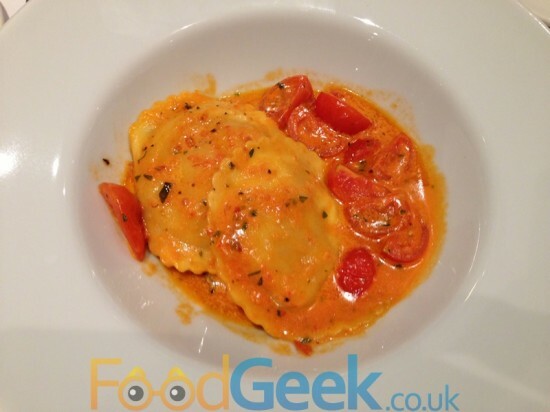 My favourite ever dish is probably the Lobster Ravioli i’ve had twice at Restaurant Gordon Ramsay but I was doing my very best to put that out of my mind as I tried the Italia version, comparing it to the signature dish of a 3 Michelin star restaurant would obviously be ridiculously unfair. Thankfully this version good in it’s own right. The pasta soft and thin, the tomato sauce light and sweet. I did feel the lobster filling could have had a better texture though as it seemed almost pureed but I would have preferred chunkier pieces. 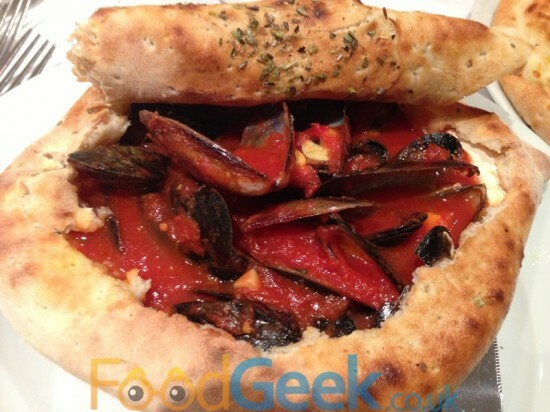 Mrs FG chose ‘Zuppa di cozze’ which is a famous Sicilian dish of mussels baked in a tomato sauce with a pizza topping lid. This was an intriguing dish from the moment it arrived, cutting through the pizza dough lid was a lot of fun and the cloud of steam that escaped once it was opened up smelt delicious. The mussels themselves were cooked very well which is impressive when they’re baked blind, the sauce was OK but not as flavoursome as I was expecting given that it had the benefit of all the mussel juices leak into it. It was quite sweet and really only tasted of tomato which was a bit disappointing, it would have been great with some chilli heat and some acidity. It did taste pretty good when mopped up by the pizza base though. With a bit of work on the sauce it could be a really great dish. For my main course I just had to pick a dish containing my greatest discovery of 2012, Nduja, an amazing spicy spreadable sausage which I fell in love with the moment I tasted it. On my last visit I had it on bruschetta and pizza, this time I went for ‘Merluzzo Nduja’ which is roast cod with a spicy nduja crust. I also ordered a side of green beans with chilli & garlic. 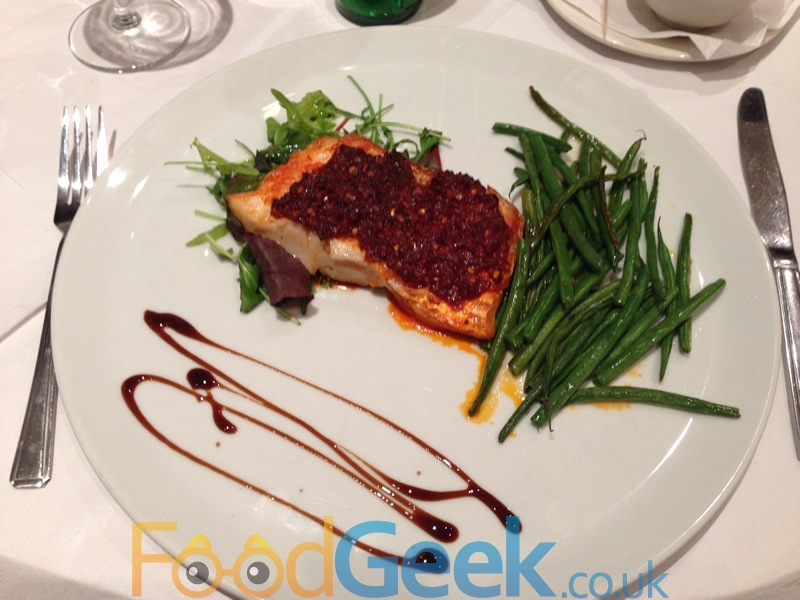 The fish was very well cooked and the Nduja crust was fantastic, i’m quite sure you could spread it on just about anything and it would taste amazing. Unfortunately the green beans were a bit over cooked and lacking in seasoning as well as the chilli and garlic as described. 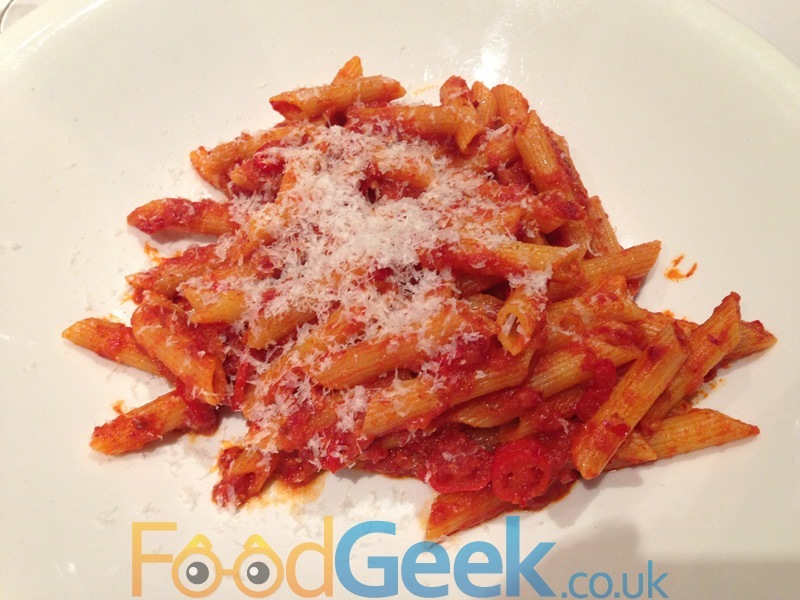 Mrs FG also went for a dish containing Nduja, ‘Penne all’ Arrabbiata’ which just happens to be my favourite pasta dish! But i’d never had it with Nduja before, so how would my favourite pasta dish taste when it included my new favourite ingredient? Good, very good! Perfectly cooked al dente penne pasta in a simple but delicious tomato sauce, with a good chilli kick. I thought the portion size was a little on the small side but it certainly delivered on taste. You may have noticed that we’d been very restrained with our ordering by our usual standards. This was for a very good reason. We had intended to try several of the new desserts (well it was a birthday!). Definitely the Rum baba & pannacotta, almost certainly the cheesecake (depending on the topping) and just so it didn’t feel left out probably the ‘Tiramisu Italia’ too. I was a little surprised that the waitress didn’t offer us a dessert menu when she removed our plates or at any point in the next 10 – 15 minutes whilst I was trying to attract her attention. Nothing like as surprised as when I finally asked for the menu and was told that they they didn’t have any desserts though. None. At all. How can a restaurant have NO desserts? Apparently it was a combination of a new head chef/kitchen team and a bloody Donny and Marie Osmond concert at Manchester Arena the previous night. Both reasonable I suppose but I still find it amazing that they had absolutely nothing at all, remember it was only 6pm and still empty so it’s not like they’d sold out on the night they must have literally had none all day. I’m sure any decent chef or kitchen team could rustle up a cheesecake or panna cotta in an entire day, new or not. The waitress was very sympathetic and apologetic but I still would have really appreciated being told when we arrived. Not only so that we could have decided whether to go elsewhere and return when they did have desserts but even if we’d decided to stay we’d have certainly ordered more starters and main courses. After getting over the shock and disappointment I asked for the bill but before it arrived two waitresses approached the table carrying a plate and singing Happy Birthday! The plate contained 2 chocolate topped, cream choux buns and a lit candle which a slightly embarrassed looking Mrs FG blew out after the singing ended. The buns were actually really nice despite being bought from the local Tesco Metro by Dom the manager who had sneaked out to get them. It was the gesture that we appreciated even more. A birthday without dessert is a very sad thing but he didn’t let it happen. Dom also reduced the bill slightly which wasn’t necessary but was appreciated. We left feeling much happier. Overall it was an up and down visit. I actually felt like the food wasn’t as good as our previous visit despite being in soft launch period then and now being fully open and of course having no desserts at all still amazes me. However, I feel it’s not fair to judge them too harshly on the same day the new chef and kitchen team started and whilst the restaurant was empty so am putting it down to bad timing. There were high points with some of the dishes and they saved the night with their attitudes and commitment to customer care. I still believe in what they’re doing and will certainly be back for a third visit but I’ll definitely be checking that they have desserts first next time. My wait for the elusive Rum baba goes on. Previous: What’s Bigger Than A Big Mac? A Big Manc!